iPhones are now able to rival many point-and-shoot cameras. They only lack one aspect – optical zoom, which would require a telescoping lens. iPhones carry digital zoom. Digital zooms crop the middle section of what the sensor sees and then enlarge it to fill the frame; image quality degrades noticeably. Optical zooms use telescopic elements to magnify the image before it reaches the sensor. Results depend on the quality of the glass, but optical will always trump the digital zoom. Olloclip is one such highly rated lens for your iPhone. The Olloclip is built for the immediacy of smartphone photography, with three distinct glass lenses tucked into a compact package that slaps onto the corner of your iPhone without so much as a screw twist. On one side is a fish-eye lens for tight spaces like elevators and diner booths. On the other, there’s an 18mm equivalent wide angle. Macro lens – The Macro lens applies roughly a 10x multiplier and allows you to focus the iPhone within 12-15mm of the subject. The Macro lens is cleverly concealed within the olloclip and can be accessed by unscrewing the Wide-Angle lens that is normally attached to it. Wide-Angle lens – The Wide-Angle lens is great for when you need that extra field of view, approximately double that of the normal iPhone. Olloclip is a must have for Instagram addicts. It attaches in seconds and is highly versatile. Only downside is that it doesn’t fit over bumpers or cases. 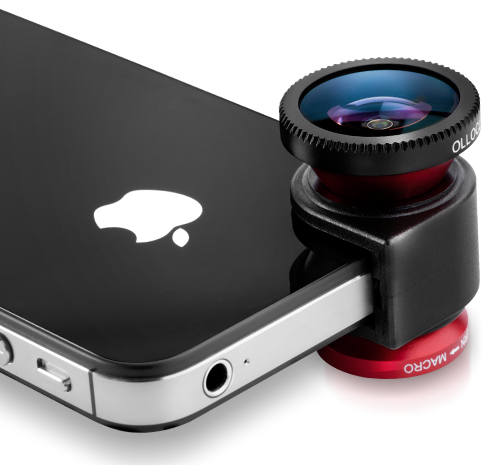 Olloclip is available for both iPhone 4/4S and iPhone 5.